Maria Merian (1647-1717) was a true pioneer. As a young girl, she was passionate about two things – insects and art. Maria lived in a time when religious superstition and long-held traditions and rules about the source of all of life, reigned supreme. Maria’s fascination in insects and her skill in art meant that she was perfectly equipped to dispute the “norm” – Supported by close friends and family she was the first individual to study, record and paint the Metamorphic Lifecycle of butterflies. Her ground-breaking discovery challenged ideas about the origins of insects, in place since the time of the Ancient Greeks. Maria’s beautiful paintings produced as a result of her research capture her discoveries for prosperity – Each painting, a beautiful, intricate and colourful homage to the Metamorphic Lifecycle. She is now widely credited as being one of the most influential entomologists of all time. 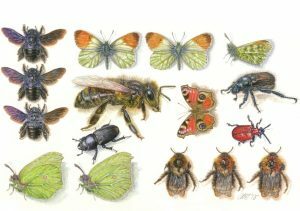 This workshop will study her life and achievements in more detail, culminating in producing a painting in her style – Full of colour, texture, beauty – and insects!